The 106-PR-10159, which is UL labelled and listed, is ideal for automatically reducing a higher inlet pressure to a steady lower discharge pressure, regardless of fluctuations in flow or inlet pressure.The valves are based on the 106-PG control valves and are available in a complete range of sizes from 2 in / 50 mm to 8 in / 200 mm. 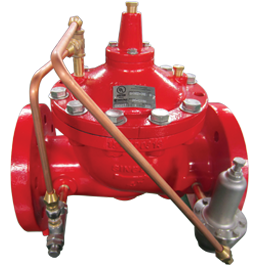 In typical pressure reducing applications, the globe style 106-PR-10159 is often the preferred valve style. Download the 106-PR-10159 Product Guide. To receive pricing on this product, please click below to contact a Singer Valve representative.